If I didn’t have you at Robot, Pirate, or Robot-Pirate, you might as well stop reading now. Well, maybe if MMO didn’t get you? Ah, what the heck, read on and see what 6waves Lolapps has in store for you on your iPhone and iPad. 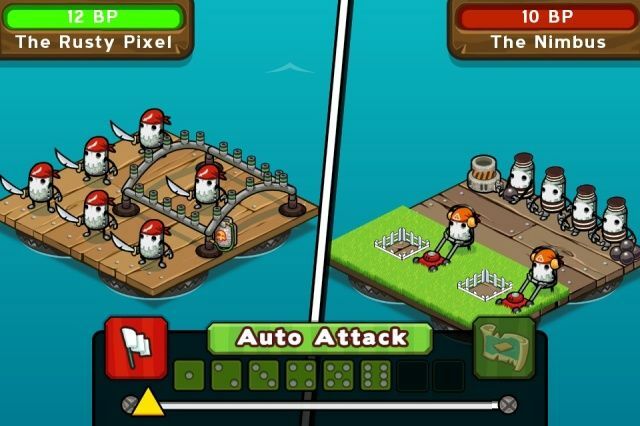 In Raft Pirates, you play as the Pirate Captain, building your ship and crew to attack other pirate-y robotic players from your friends list on Game Center or Facebook, plundering their treasures and ships. Ship building and expanding plays like a fairly typical city/town builder game, with salvage to bring up and use in creating bigger ships and badder weapons. One unique difference here is the salvage diver mini game, which nets you bonus items as your diver goes a little overboard in collecting the junk from the ocean below him. Combat takes place turn by turn with a sort of Risk board/dice game feel to it. You tell the game which deck you’re fighting from, and which deck you’re attacking, and you roll a number of dice to determine the outcome of the battle. In addition, your frenemies will be able to attack you whilst you are away, giving Raft Pirates that extra-added competitive punch. Once you blow your opponent’s boat to smithereens, you gather up the wreckage, gaining salvage which you can then put back to good use on your own tub of terror. There are mission quests as well, having you pick a certain number of fights, or gather a certain amount of a given salvage item, which will net you progress in the game. Raft Pirates is a cute game with some interesting and varied gaming mechanics, and it’s free in the App Store now; why not give it a try, ya scurvy dogs!